Be the first to share your favorite memory, photo or story of Johnny and . This memorial page is dedicated for family, friends and future generations to celebrate the life of their loved one. Johnny Ivan Nelson and his beloved wife of 38 years, Teresa Fay Nelson, both passed from this life on Thursday, January 10, 2019. Johnny was born on May 31, 1952 in Pascagoula, MS to the late, Ernest Nelson and Dean Howell. Teresa was born on October 1, 1954 in Fort Campbell, KY to Millie Grant and the late, Willard Grant. Johnny and Teresa loved the outdoors and enjoyed camping, boating, and fishing. Johnny worked as a nurse anesthetist for Singing River Health Systems for over 35 years until his partial retirement in 2016, and then went part-time for the outpatient surgery centers. This freed his time for more fishing trips with his work friends. Teresa retired from Coldwell Banker, Smith Homes Realty in 2017, and enjoyed spending her new found free time on girls’ trips and cherishing her time with Johnny. They did everything together and always looked forward to their time spent at their hunting camp in Neely. The hunting camp was their refuge; they would always say that when they passed, they would want it to be together and preferably at their hunting camp. Although this wasn’t the way they had in mind, we find comfort in knowing they are now together eternally. They will both be remembered for the love they had for each other, their family, and for the loving heart they shared for their dogs. In addition to Johnny’s parents, and Teresa’s father, they were preceded in death by her step-father, Cecil Stork and his sister, Janice “Deanie” Johnson. They leave to cherish their memories two daughters, Tia (Alan Ray) Collums and Keri (Monty Allen) Wiggins; grandchildren, Kayla Collums, Cain Collums, Brittney Wiggins, Lauren Wiggins, Klaire Wiggins, and Mo Wiggins; fur-grandbabies, Thor, Bentley, Izzy, and Goldie; great-grandchildren, Emma, Alyssa, Breanna, and Finley; Johnny’s siblings, Doris (Jim) Wade, Terri Nelson, Lonny (Stacey) Nelson, Kate “Dimples” (Ben) Lee, Vera Nelson Arnoni, and Derek Clark; his step-mother, Catherine Taylor; Teresa’s siblings, Marilyn (J.F.) McLeod, Sandy (Larry) Wallace, and Neal (Candi) Grant; her mother, Millie Grant; and their fur-baby, Lucky Dog; along with numerous nieces, nephews, other family, and friends. 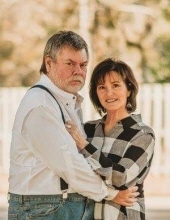 A service to celebrate their lives will be held on Saturday, February 16, 2019, which would have been their 39th wedding anniversary, at 4:00 p.m. at the Hickory Hill Country Club in Gautier, MS. Any and all that knew them are invited to attend and celebrate their legacy with us. In lieu of flowers, the family requests donation be sent in memory of Johnny and Teresa Nelson to Operation Rescue, 20609 Cameron Lane, Moss Point, MS 39562. To send flowers or a remembrance gift to the family of Johnny and Teresa Nelson, please visit our Tribute Store. "Email Address" would like to share the life celebration of Johnny and Teresa Nelson. Click on the "link" to go to share a favorite memory or leave a condolence message for the family.